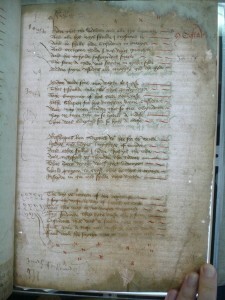 The ‘Mapping Medieval Paper in England’ Project was funded by a Cambridge Humanities Research Grants Scheme 2014/15 with the aim of preparing a new dataset of Medieval Paper Manuscripts written in England between 1300 to about 1500 to consolidate the data that Dr Da Rold has collected to date. The Project started in February 2015 and finished on 30 September 2015. The project team [Dr Da Rold Orietta (PI), Dr Hollie Morgan (RA), Mr Pidd (Technical advisor), Professor Beadle and Dr Paul (Co-Is)] created an electronic database, building on the data already gathered by Dr Da Rold and adding from existing catalogues and databases: Ker’s Medieval Manuscripts in British Libraries, the Linguistic Atlas of Late Medieval English, Boffey and Edwards Index of Middle English Verse, the Index of Middle English Prose, the Late Medieval English Scribes project, the Manuscripts of the West Midlands project and individual library catalogues. Data retrieved from other books, libraries and personal communication were added into this dataset too. The team gathered to date evidence from 5841 manuscripts of which at least 736 are written on paper. The fields, which we have chosen to populate the database, include manuscripts’ shelf-marks, localization, content, date, language, material and name of the scribe if known. The picture that the database provides highlights the paucity of extant research and records the need for further exploration of English paper manuscripts. However, it also reflects established links between paper stocks, production, dissemination and use, which must be explored and analysed in more detail. This information will form the basis for future funding applications. Should they be successful, they would allow us to shed new light on the significance of paper in the rapidly developing societies of the later middle ages and the ways in which books and documents were produced and used. However, the database in itself is a valuable resource. We hope to be able to make this database available in due course, as we believe that the publication of the database would be invaluable for scholars working on a myriad of projects associated with texts, manuscripts, materiality and social networks in the later middle ages. This entry was posted in Fifteenth century, Fourteenth century, The Paper Project by admin. Bookmark the permalink. Do you, by any chance, have any data on the introduction of, or the earliest appearances of, paper in Wales? The earliest citation of the borrowing ‘papir’ (fr. 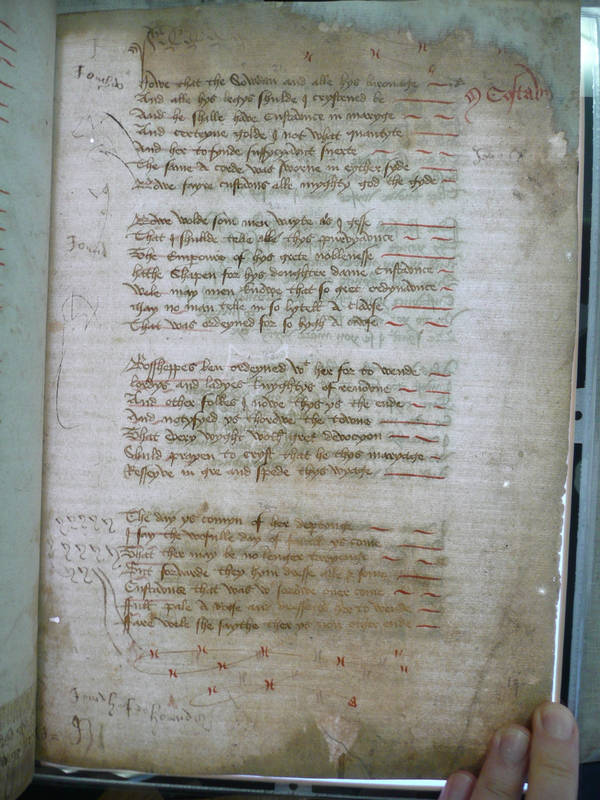 ME) is in a poem by the great Welsh poet Dafydd ap Gwilym (?1315-?1350), comparing the fair complexion of a young woman to ‘lliw papir’ (“the color of paper”). The next citation, from the poet Gruffudd ap Maredudd (fl. 1352-1382), uses ‘papir’ as the color of a castle (presumably whitewashed). Clearly, the whiteness of paper had become an ideal for whiteness fairly early on, perhaps originating with Dafydd (like Shakespeare, a prolific linguistic borrower and innovator). The citation from Dafydd almost certainly predates the earliest English citation (Gawain and the Green Knight, 802, also referencing a white castle), and that from Gruffudd may be earlier as well. Any information you may have to shed some light on this would be very welcome.